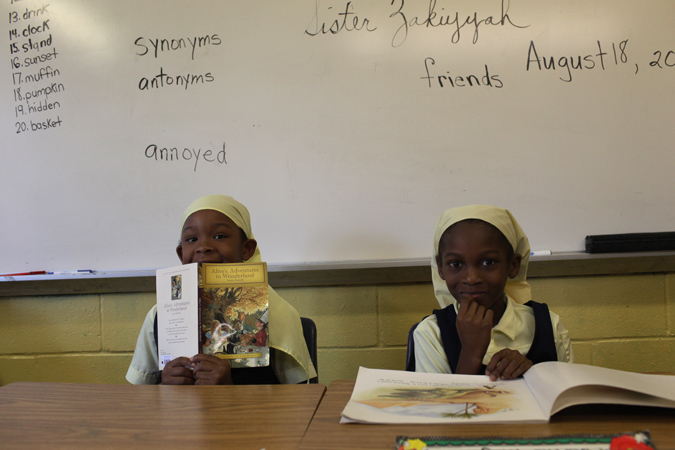 Reading time turns into photo time. Growing up in the public school system, I’ve always been curious on what a full-time Islamic school looks like from the inside. 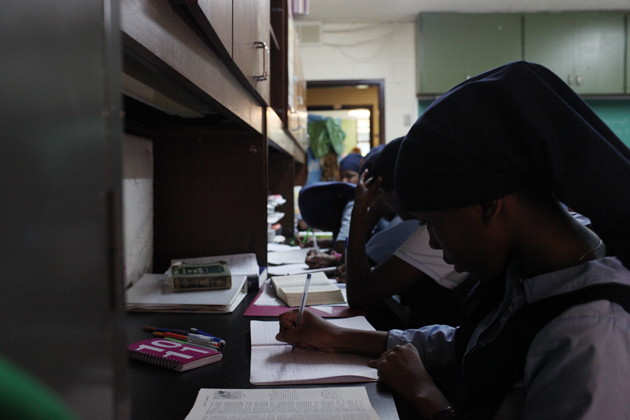 I decided to do a small photo essay on the Mohammed Schools in Atlanta, Georgia. The Mohammed Schools consists of an elementary, middle, and high school. It is said that 100% of the seniors from the school go to college after graduation to prestigious institutions like Harvard. The girls basketball team, the Lady Caliphs, has made it to the state championships and was featured on ESPN not too long ago. 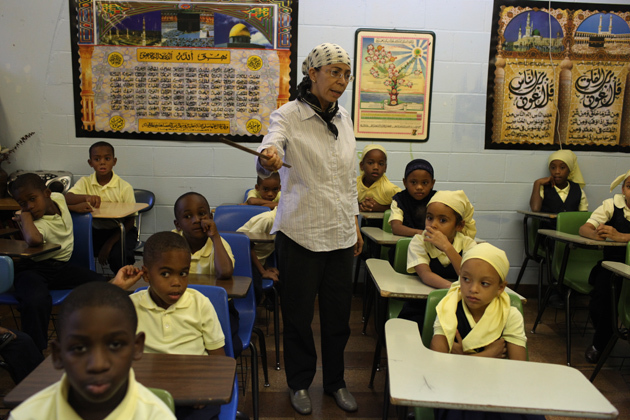 Sister Jamillah Bouchta leads her first grade Arabic class in Quran recitation and translation. Girls in middle school look up difficult words in dictionaries. After the midday prayer, dhuhr, high school girls come out to play a short game of basketball. 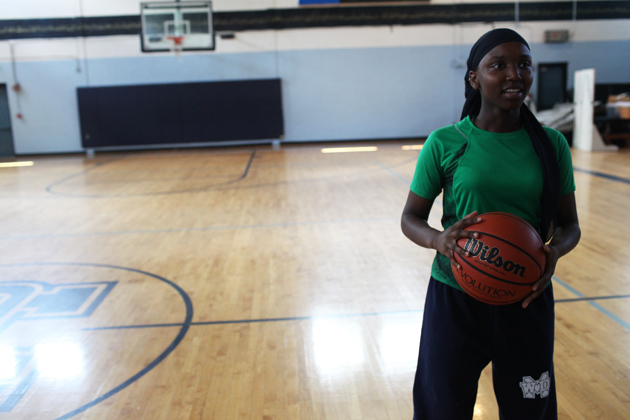 The Lady Caliphs basketball at the Mohammed School made it to the state finals two years ago. The story was covered beautifully by ESPN. 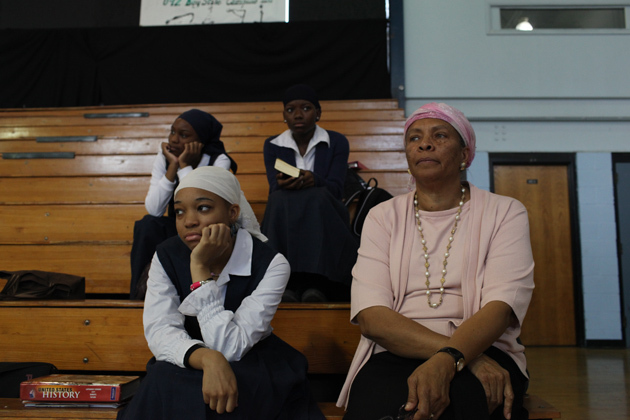 Safiyyah Shahid, the high school principal, watches the Lady Caliphs basketball team warming up. 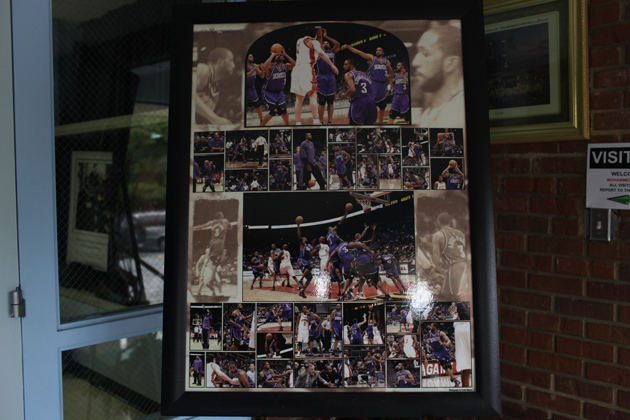 Pictures of Shareef Abdur-Rahim, a former NBA player for the Sacromento Kings, plasters the walls of the gymnasium. Abdur-Rahim donated the money to build the gymansium for the school. He is also a graduate of the Mohammed Schools. Seniors discuss the Park 51 mosque in their "Quranic Thinking" class. Led by the former Imam of the mosque, Plemon T El-Amin, students are being taught how to engage in a constructive discourse on this sensitive issue. The Mohammad Schools building is in close proximity to the Atlanta Masjid. Though the school is its own entity, it falls under the jurisdiction of the Atlanta Masjid. Students kill time before iftaar, break fast, watching YouTube clips on an iPad in the lobby of Atlanta Masjid. Today's clip: "Charlie bit my finger." 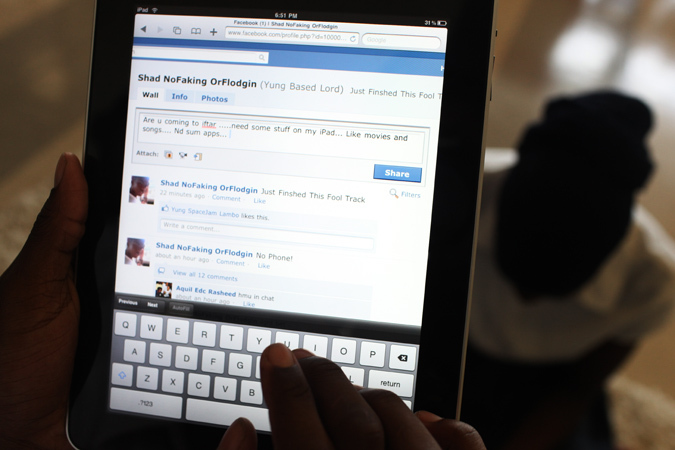 A sudent sends a Facebook message to a friend on his iPad. The message reads,"Are u coming to iftaar...Need some stuff on my iPad....Like movies and songs...Nd sum apps." 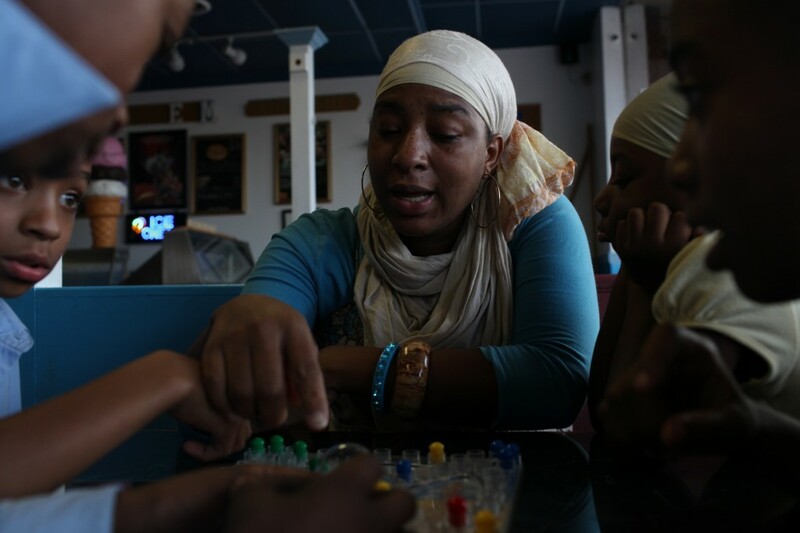 A family plays a game of trouble before iftaar, the break fast, at the neighboring fish restaurant. 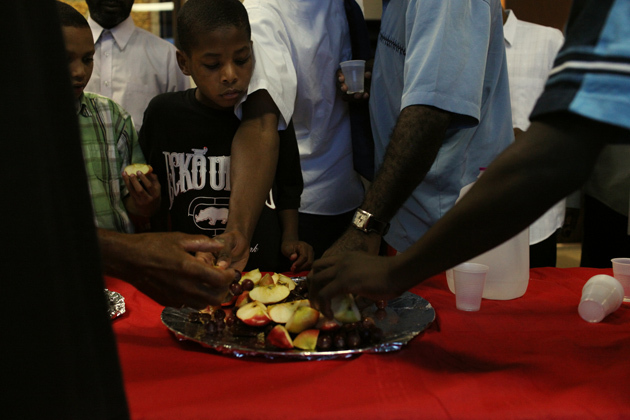 Like most mosques, the Atlanta Masjid community breaks their fast with dates and water. 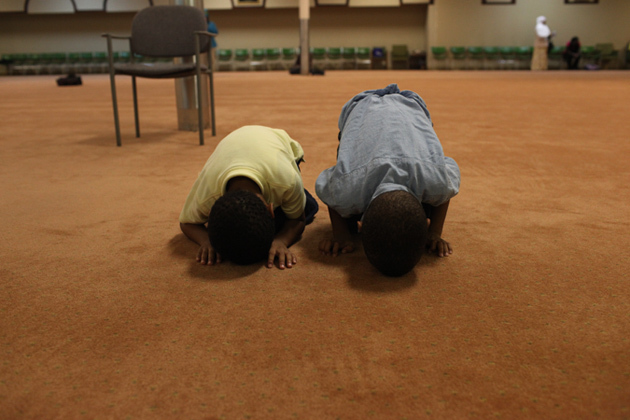 Two boys prostrate in the mosque during salaah, the Islamic ritual prayer that is performed five times a day. Prostration during salaah is considered to be the moment that one is closest to God. 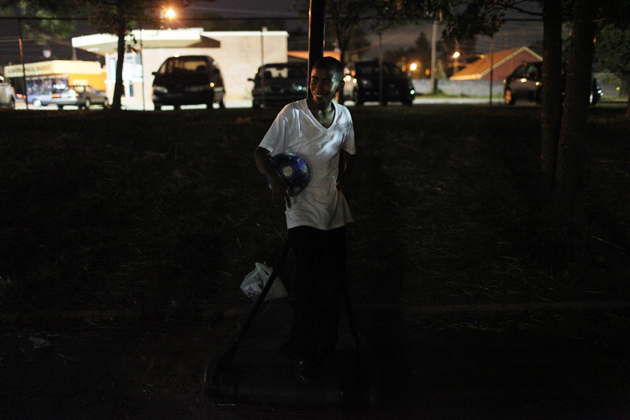 A boy takes a shot at the basketball court. 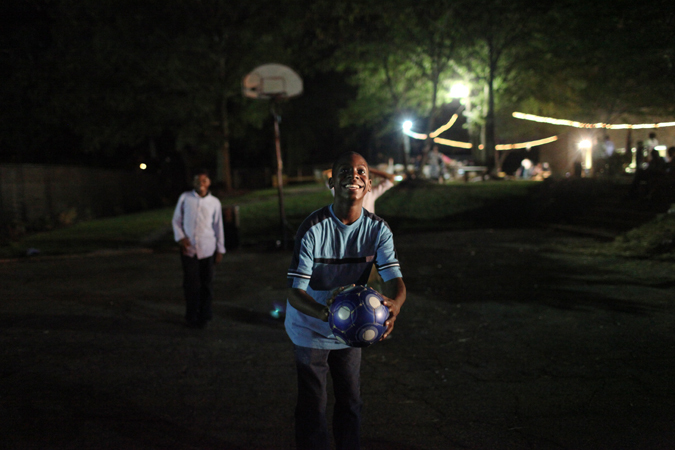 Students regularly play basketball after the break fast dinner. Yay, Atlanta! Hope your time here was enjoyable! From the pictures it seems like it was. I’m enjoying this year’s blog on your travels! Keep up the good work! Atlanta tops all the coverage you guys did so far,very fascinating story and backed by the perfect pictures. Keep up the good work we are looking forward for more similar stories. Salaams, The pictures make me & my wife home sick. I am impressed with this school. Wow. By the way, can you gentlemen also discuss foods that you are eating? I think a lot of effort and teamwork goes into preparing these iftaars. Its interesting. Just a thought. Was trying to find a good school for my child, where can I find information on the elementary school? http://www.mohammedschools.org! Have fun exploring our site! Dilawar mamoo, thank you for the kind words and following our blog. Please continue giving us your feedback. That picture of the boys in sajdah gave me a great feeling inside despite the long day that’s making today the “New Monday”. Thanks, guys. 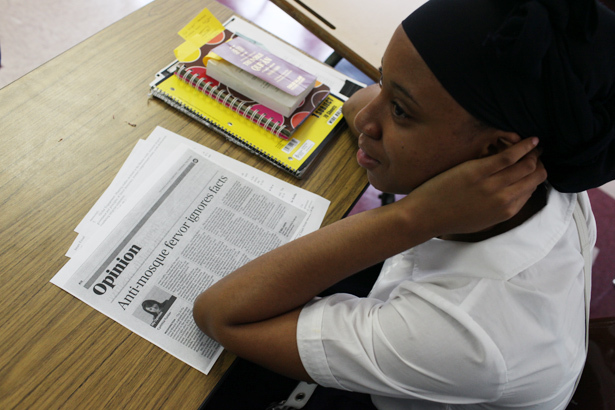 Your photos are wonderful and remind me of my own experiences as student attending Sister Clara Muhammad School in Philadelphia (way back in the late 1980s/early 1990s). May Allah bless you brothers and keep you safe while traveling. i love brother Plemon El-Amin! and these photos are amazing. Too bad cultural aspects still keep some communities from having a muslim school in countries like mine. I went to a Christian/Methodist school and it was great, it was one of the best schools in Panama, but I always felt something was missing. Now being in college and studying to become a teacher, I hope someday I have the honor to teach in a Muslim School like this, in my own country. Naima from Republic of Panama (not to be confused with Panama City, Florida lol). awesome school inshallah they keep up the good works. I love your project. It’s totally cool. Going down the road with you, I take part not only in Muslim life but also among the communities of just good people. I shall return home soon, insha’allah. Cannot wait. I just wanted to tell you guys that I love getting on here and reading about your adventures =D. InshaAllah I’ll probably be meeting you guys Tuesday when you hit up my neck of the woods. mashallah, thank you for sharing your journey with us. Just wondering if you are avoiding the larger Mosques on purpose? It seems that most of these smaller mosques have a friendlier and more relaxed atmosphere than what I have experienced in my 20 years as an American Muslim. Most of the African American Muslims in our community practice a very strict Salafi version of Islam which requires complete segragation, niqab for women, etc. Looking forward to the rest of your blog. Peace and Blessings! 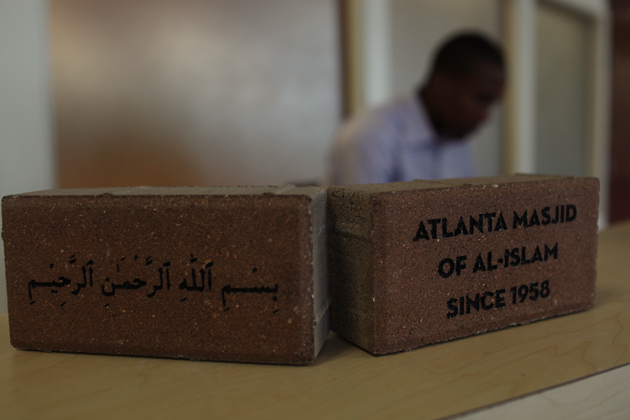 The Atlanta Masjid community may have the largest community of believers in the Atlanta area. It is the oldest masjid in the state of Georgia (more than 50 years). There is only one other masjid in the metro Atlanta area that may have as large of a Muslim community as the Atlanta Masjid’s. I am happy the 30 Mosques tours brought all of the visitors to the Atlanta Masjid and its Mohammed Schools of Atlanta. So often, coverage about Muslims is limited to those outside of the majority African American communities. This is a great way to expose those that tend to be overlooked. Alhamdulillah! lol @Suad… I think im the only panamanian reading the blog(at least for now! )… I posted the link to this webside on my facebook a couple of days ago so more people learn about what a great project u guys are doing. Thank you again for your posts. I particularly loved the pictures of all the beautiful children! I hope they all grow up healthy and happy. 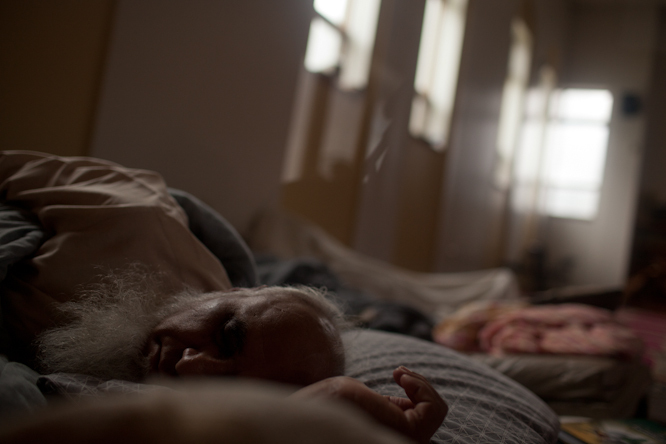 Absolutely loved this photo essay mashAllah. This was a great post and I loved the photos. MashAllah what adorable children! OMG. If I lived in Georgia, I would want to go here! Too bad I live in California. Masha Allah… Atlanta Masjid was my destination, Taqwa Productions, Hassan Shakir my teacher and friend. Wow…what a great project and awesome stories. May your journey and work be rewarded by Him! I enjoy the pix very much! Btw, Im Malaysian! Masha´Allah im hope we can reach in organisated islamic school like in the usa also here in europe. I am so optimistic about this particular Muslim community with which I have been participating for over 30 years off and on. Seldom have I prayed for the success of a particular community as I do for this one. The visionary leadership of Imam Plemon caused him to step aside in favor of youth and future in the form of the new Imams Mansoor and Sulaiman. Finally, kudos to the Mohammed Schools for opening higher education and pride for the Ummah by achieving 100% matriculation. It is such a relief to see these things..
MashaAllah. This post is so beautiful and refreshing. This put a big smile on my face. Sending my love on behalf of the Knight sisters. These are my favorite pictures, yet! I was in the first graduating class at this Mohammed Schools, I attended since Pre-K, I now WORK at this Mohammed Schools, my children attend this Mohammed Schools, and I’m STILL so impressed with the photo essay! LOL!! Alhamdulillah!! Keep up the great work , guys, and I pray that everyone on this blog continues praying for the success of Islamic Independent Education! A very interesting blog. I’m enjoying it very much after reading the CNN article about your travels. Being from the deep south I was most interested in your experiences here and how immigrant muslims are being accepted or unfortunately in some cases not accepted into communities. As for me, I am a white christian woman from a very small town in south Georgia married to a muslim Moroccan man who immigrated here from Morocco but is now an American citizen. We have not had any problems with the fact he is muslim or an immigrant. I guess we’ve been blessed. LOVE the photo of the praying boys!! 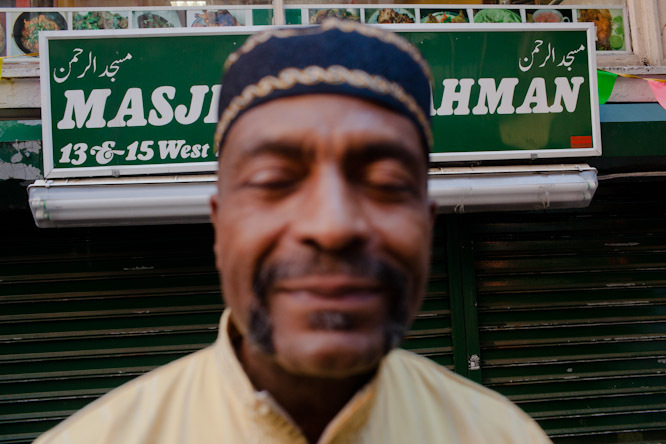 And I agree with the post about how nice it is to see African American Muslims profiled. My experience with many Muslim schools has been that the quality can be, well, under-performing. So to see this incredibly successful Muslim school is REALLy inspiring. Mash’Allah, GREAT job!!! Just wish I had a similar one in my area. good thing as balance transfer credit cards. on TV, so I only use the web for that reason, and obtain the newest information. Hiya very cool website!! Guy .. Excellent .. Superb .. I will bookmark your site and take the feeds also? put up, we’d like work out more strategies on this regard, thank you for sharing. something that I think I would never understand. It seems too complicated and extremely broad for me. bookmark your website to come back later on. Hello colleagues, how is all, and what you would like to say concerning this piece of writing, in my view its actually remarkable in favor of me. security issues with my latest website and I would like to find something more safeguarded. Hello mates, how is the whole thing, and what you desire to say regarding this piece of writing, in my view its in fact remarkable designed for me. discussed for ages. Wonderful stuff, just excellent! If you wish for to get a good deal from this article then you have to apply such strategies to your won weblog. your weblog? My blog is in the exact same niche as yours and my users would genuinely benefit from a lot of the information you provide here. Your favourite reason seemed to be at the internet the easiest thing to keep in mind of. Hello to every body, it’s my first go to see of this weblog; this website contains awesome and really fine information in support of readers. site; this website carries remarkable and truly good data in favor of visitors. I will bookmark your blog and check again here frequently. I’m quite certain I will learn many new stuff right here! Hello it’s me, I am also visiting this site on a regular basis, this website is actually nice and the visitors are really sharing nice thoughts. at here and i am genuinely pleassant to read all at one place. Undeniably imagine that which you stated. Your favorite justification appeared to be on the internet the simplest thing to be mindful of. consider concerns that they just don’t realize about. good results. However, some people, even people who are doing just as much if not less than you could very well be more successful than you at times. you are now not really a lot more well-liked than you may be right now. You’re very intelligent. You understand therefore significantly in relation to this subject, made me individually imagine it from a lot of various angles. to do with Lady gaga! Your own stuffs nice. All the time maintain it up! コーチ bought everybody in the wintry weather by way of model ft .. This is certainly really legitimate time as improved around the blogging site. Treasure discussing throughout.